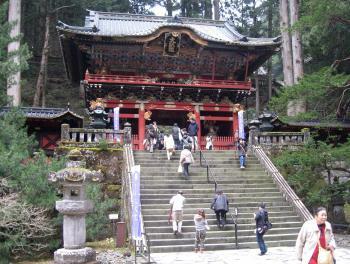 The Shrines and Temples of Nikko are a traditional Japanese religious centre with Shinto shrines and Buddhist temples. The surroundings of Nikko have been known for ages as a holy place. The temples and other shrines in this area originate from the 17th century and attract attention because of their rich decorations. The well known carvings of the three see-no-evil, speak-no-evil, hear-no-evil monkeys can be seen on the Sacred Stable. A few steps from that, the Youmeimon gate boasts over 300 carvings of mythical beasts, such as dragons, giraffes, and lions, and Chinese sages. Another reason for rewarding Nikko is that it is associated with the Shinto perception of the relationship of man with nature, in which mountains and forests have a sacred meaning and are objects of veneration. The mountaneous landscape, the trees, the rocks: they all form part of the site Nikko. There are a lot of temples in Japan, but the ones at Nikko I liked most. Nikko at its own disproves the common remark that Japan does not have world class sights. The Toshogu-shrine is the best example of this. The main gate inside the complex is 11 metres high and painted with animals, flowers and human figures. Especially the smallest details (which you can only see with binoculars or the zoom lens of your camera) are magnificent. What at first just looks like a coloured border later turns out to be a whole scene. I visited Nikko in the fall of 2007. Nikko is a small town and the temple area is located in a wooded area about a 30-minute walk from the train station. I managed to visit Nikko on a day trip from Tokyo. About half of the trip is via the fast Shinkansen, and the other half is a much slower local train. The most famous thing in Nikko is probably the wood carving of the "hear no evil, see no evil, speak no evil" monkies. That trope has its origins here. I highly recommend visiting Nikkor for anyone with a few days in Tokyo. Read more about the Shrines and Temples of Nikko on my website. The town itself feels like a ski resort in summer… which it kind of is. But what I mean is that the visitors come for the day to walk in the hills or visit the religious sites but they don’t set up base for longer than eight hours or so. The few hotels near the train station all have vacancies and in the evenings most restaurants are either closed or empty. It’s during the day that there are queues out the doors for the popular lunch joints. Nikko is an enchanting complex of temples, shrines, and gardens idyllically located in mountains north of Tokyo. The site is located within Nikko National Park, which is an easy day trip from Tokyo. 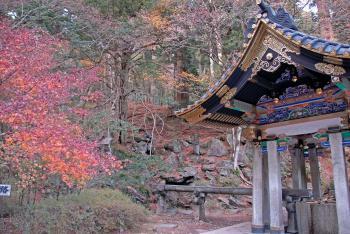 I traveled to Nikko in November 2010 and enjoyed great autumn weather during my visit. I was not alone at the park, as many local visitors were also appreciating the pleasant weekend; I even encountered a wedding at one of the shrines. Of the shrines and temples I visited, I was most impressed with Toshu-gu Shrine, which had a brilliant, intricately carved and painted gate, as well as a photogenic five story pagoda. Within the shrine was the famous wood-carving of the Three Wise Monkeys (see no evil, speak no evil, hear no evil). Also of note at Nikko were Futara-san Shrine, which included a copper torii and a sacred bridge, and Rinno-ji Temple, which included a shogun's mausoleum as well as a treasure house and a garden. 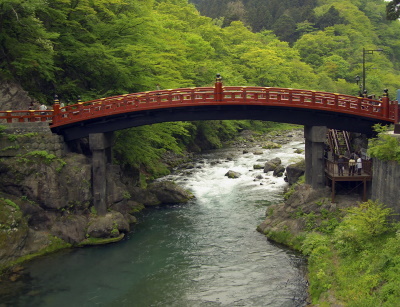 After the non-stop busy-ness of Tokyo, Nikko was a welcome retreat to nature in Japan. Logistics: Nikko can be reached by train from Tokyo. A local bus system provides access to the park. I visited this WHS in November 2009. 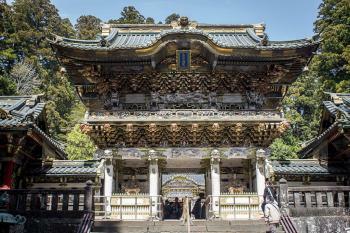 The shrines and temples of Nikko, together with their natural surroundings, have for centuries been a sacred site known for its architectural and decorative masterpieces. They are closely associated with the history of the Tokugawa Shoguns. You could easily spend 3-4 days here to try to cover all the sights there are to see. Nikko is a beautiful area. The World Heritage sites are all within easy walking distance from each other. There is a bus specific for the sites as well. I took the train from Asakusa, Tokyo and used the World Heritage Pass. It covers the roundtrip train ticket on the Tobu line and entrance to the sites. It doesn't however pay for special exhibits within the sites. The buildings were beautiful and very peaceful. Toshogu had construction and renovations going on but the main gate and buildings were visible. I would recommend going as early as possible to the sites. Since Nikko is a very popular destination there are many tour groups as well as school trips there. After around 9:30a.m., the temples and shrines lost a little of their tranquility and became more of a circus. But overall I would go back here again and recommend it to others. There is more to the area than just the World Heritage sites. Nikko is also in a national park with hot springs, waterfalls, hiking, and a large lake. To do both the sites and the park will require a stay overnight as the natural areas are at least an hour away by bus. Also Nikko is famous for yuba (tofu skin) so try some of the great yuba cuisine while you are there. To visit the heritage in Japan, my first choice is Nikko. The constructor showed his power and treasury to build the most beautiful and colorful temples in Japan. 3.0: Solivagant Alexander Parsons Carlo Sarion Nan Tony H.
Notable Bridges: Sacred Shinkyo or Shogun's Bridge (1638), the oldest known cantilever. Famous Bells: Korean Bell in Nikko A large bell hangs in a pavilion near a pagoda in Toshogu Shrine, the final resting place of Ieyasu Tokugawa, the first of the Tokugawa Shoguns. The bell was a gift from the Joseon Dynasty of Korea. Gilded Lacquer or Urushi: Toshogu Shrine and Taiyuinbyo shrine are well known for black and gold lacquer wall. Undergoing Restoration or Repair: The main hall at Rinnoji remains enclosed by scaffolding, but remains open through its restoration, which is expected to be complete in March 2019. Also, the prominent Yomeimon Gate at the Toshugo Shrine is also undergoing restoration and covered by scaffolding; this restoration is also expected to be complete in March 2019. 169 Community Members have visited.